This Christmas stocking has snow, sparkling bling winter all over it. The theme is sparkle embroidered silver thread snowflakes, everything to give an impression of winter elegance and beauty. We have a blue velvet design also so that you can match together. Please see additional images to preview how they look together. Measured along the diagonal from the top left hand corner to the toe, the stocking measures 18.5 inches, and the width along the cuff is 8 inches. Lining: YES. This stocking is fully lined. 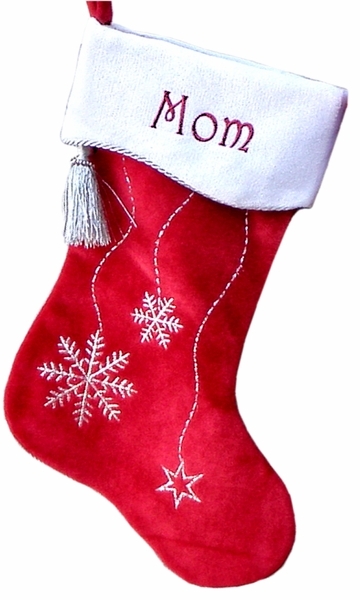 Names can be personalized on the white cuff of this Christmas stocking with METALLIC embroidery thread.